Add a fun twist to your next game night. From the maker of Bicycle playing cards how comes the Bicycle Game 4-MationÂ®! 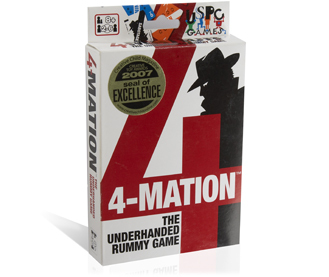 4-Mation is a sneaky rummy-based game you'll want to play again and again. The object of each round is to be the first competitor (or spy) to play all your cards to keep scoring low. A great game for children as it teaches good sportsmanship and fairness. Pair it with other Bicycle playing card games for an incredible group of card game gifts. Proud winner of the 2007 Seal of Excellence Award by Creative Child Magazine.